PetroMarker EM Survey Configurations. 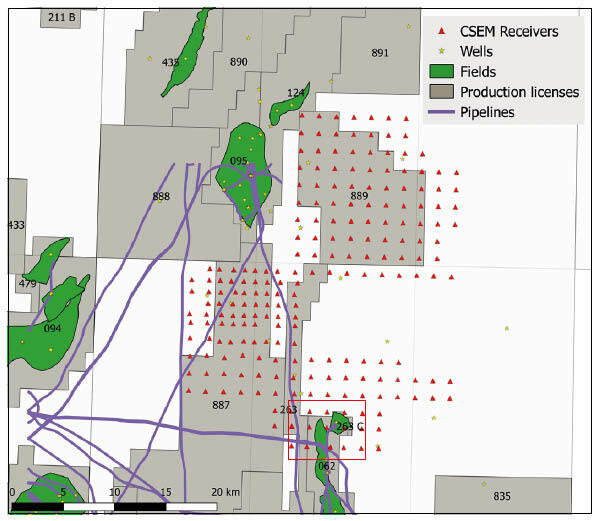 PetroMarker’s unique 3D vertical EM technology acquires robust data for new opportunities in already-explored areas where the 3D CSEM data are inverted by the CGG EM team in Milan. 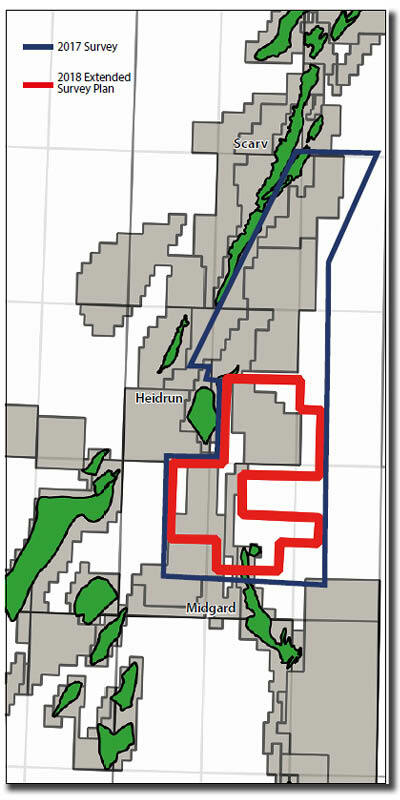 The exploration of the Haltenbanken area in the Norwegian Sea has over the years delivered several well-known fields such as Draugen in the south, up to Norne in the north, via Åsgard, Midgard and Heidrun, yet a significant portion of this productive area is still largely uninvestigated. 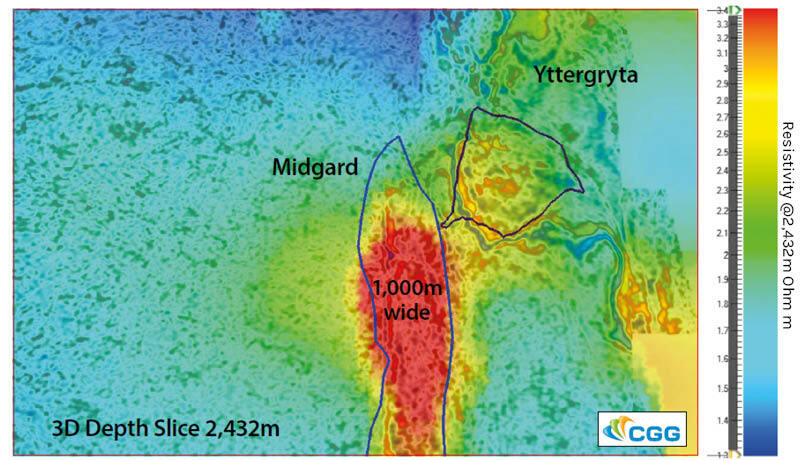 In 2017, PetroMarker carried out a 500 km2 vertical 3D EM survey in the Norwegian Sea, from the Midgard field northwards to east of the Heidrun field. PetroMarker EM Survey Extents + Extended Survey Plan PetroMarker was established in 2005, based on an idea to develop a new marine Controlled Source Electro Magnetic (CSEM) exploration technology with vertically oriented transmitters and receivers in a transmitterover- receiver-grid configuration. These advances result both in a deeper recording ability as well as abundant near-offset data, which also give rise to an increased resolution of the subsurface resistivities when compared to earlier technologies. To begin with the company provided 2D surveys, but in 2017 a dramatic improvement of the technology was launched, together with a substantial increase in receivers. With the resultant 3D ability, an alliance was formed with CGG Milan for the 3D inversion processing. The main office is in Stavanger and the company has now both Norwegian and international shareholders. The aim is to become a supplier of marine CSEM 3D exploration data on a world basis. south-east trending normal fault. The discovery prospect outline is only 400m wide where the EM anomaly was retrieved. The discovery well proved about 40m gas column in the Jurassic Garn Formation, with a gas-down-to in the Not Formation at 2,637.8m. The hydrocarbon contact for the Natalia structure was expected to be between 2,637.8m and 2,645m if it had the same pressure regime and hydrocarbon system up-dip. The updated seismic interpretation indicates that the structure spills to the north at 2,646m, which is in agreement with the expected contact. The apex of the structure is mapped at 2,575m, which gives a corresponding column height for the entire structure of 60m. Red square marks survey test area. 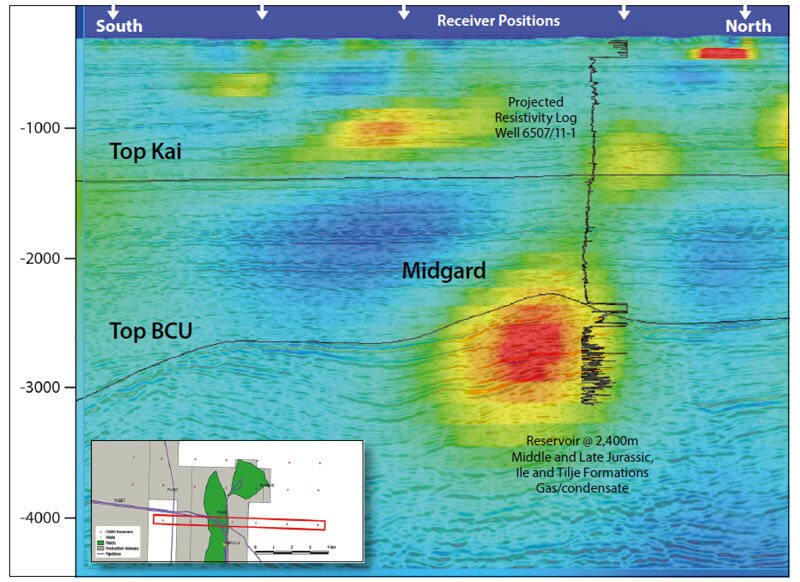 In 2017, PetroMarker carried out a 500 km2 vertical 3D EM survey in the underexplored parts of the Haltenbanken area of the Norwegian Sea, covering the area from Midgard and to east of Heidrun. The Midgard field and the Natalia discovery were used as data calibration points. 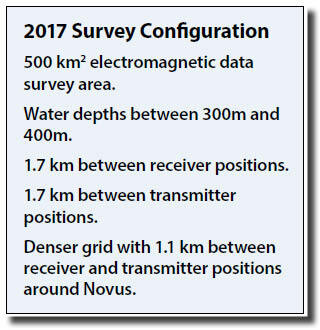 The grid of transmitter and receiver positions varied according to the purpose of the survey; for example, a much tighter grid was used over the Novus discovery in order to improve resolution. PetroMarker’s technology allows for such tailormade grids without generating operational issues. PetroMarker’s EM technology consists of a vertical source transmitting 5,000A, adjusted to the water depth, and an array or grid of vertical receivers set on the seabed, using vertical antennas both for the transmitter and the receivers. For the transmitter, two electrodes are used; the lower one is placed on the seabed, while the upper electrode hangs vertically above it suspended from the survey vessel. It is important that this alignment is strictly maintained to obtain the best possible data quality, so during pulsing the vessel is stationary and dynamic positioning is used to ensure this. The receivers are equipped with an active verticality correction of the sensor dipoles (each receiver is equipped with four sensor dipoles). They are launched from the sea surface and retrieved by acoustic release. Horizontal sensors complement the recording suite. The results of the Petromarker survey show a clear anomaly over Midgard and a weaker one over the now depleted Yttergryta Field. One remarkable feature of the technology is its application in the so-called ‘near zone’. The volume of subsurface layers impacted by the pulsing signal is narrowly concentrated between the transmitter position and its nearby receivers. Most of the energy is therefore used to penetrate the layers, and the response is not disturbed by surrounding artefacts. As indicated, the other important feature is the stationary pulsing. This means that the energy can be further concentrated by increasing the pulsing time on each location as required to optimise signal to noise ratio. The stationary approach also gives more freedom when operating close to existing installations. To test these techniques, data were acquired over the northern part of the Midgard field and the now shut-down Yttergryta field. The calibration at Midgard was performed with 21 receivers on a 1.7km grid, and 25 pulsing locations. The presence of pipelines and other structures on the seabed was accounted for by omitting and/or adjusting certain points in the grid, but without affecting the operability of the survey, the quality and representability of the data, or the security of the field.The combination of elongated reservoirs and deep water represents a good CSEM challenge for a conclusive verification of the new generation of PetroMarker’s technology and equipment. The width of the Midgard field in the area where the survey was undertaken is only about 1 km, but the EM anomaly registered both matches and follows the reservoir sandstones below the Base Cretaceous Unconformity (BCU). 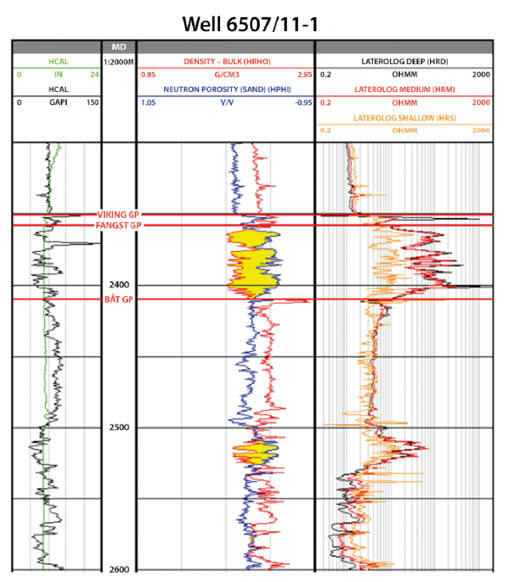 The higher resistivity above the Kai Formation was also clearly identified and agreed with the results of well 6507/11-1. The multi-client 3D CSEM data were inverted by the CGG EM team in Milan. The results show a clear anomaly over Midgard and a weaker one over Yttergryta, as well as several other interesting anomalies in the dataset. The inversions, carried out by CGG’s exclusive 3D time domain inversion codes, match the inversions carried out by PetroMarker’s own software suite, and therefore confirm the robustness of the data.